This was my grandfather's maternal brother's Confederate sword. He was a first lieutenant in the Civil War, fought with the army of the Tennessee. It's my understanding that he was wounded and got dysentery and died, and the sword in the picture came back to the family and then it was passed along through my father's family. Mom broke up the house and I ended up with the sword. It's been in my closet for... well, since '74. This is John Robert Selfridge. Yeah, Henry County, Henry County infantry. We knew you had a Confederate sword the minute that you pulled it out of the wrapper. There are a couple of things that give it away. First of all, the style of the pommel cap tells us that it's a Boyle and Gamble sword made in Richmond, Virginia. Another thing that you can look for is the single strand of wire on the grip as opposed to Federal swords, which tend to have a double strand or kind of a braid of wire on it. Doing a little research, we found that the gentleman was in the 19th Georgia, but they were sent to Virginia to fight. That particular organization was involved in a lot of hot fights. They were at second Bull Run, they were at Antietam, and then they were at Fredericksburg, which is where he was wounded. The sword has seen happier centuries. The scabbard looks like it's been kind of taken apart and put back together again a couple of times, but we did find that it is the correct scabbard for a Boyle and Gamble sword. 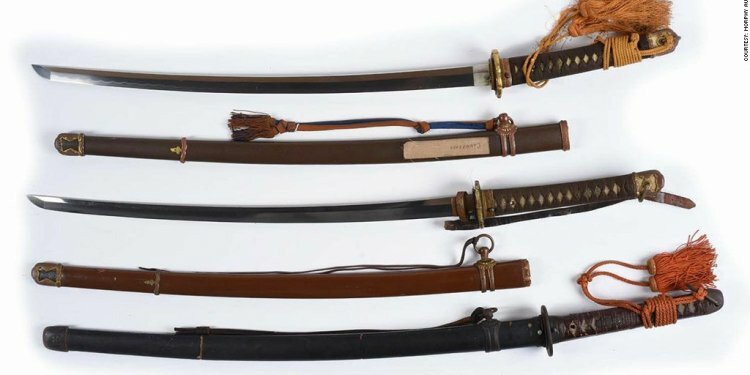 They made swords that very closely copied the Federal swords. This one's a foot officer-style. The image that you brought is this fantastic, ambrotype image of him. That's a super piece. This fellow has a couple of features here that we found particularly attractive. He's wearing a Confederate officer's frock coat, but if you look closely, you can see that he's made some hand-sewn pockets in that coat. The other thing in particular is he's wearing a two-piece Confederate officer's belt buckle. Most likely he got that from Boyle and Gamble with that sword, and it makes sense since the 19th was sent to Virginia that they would end up with equipment from that part of the world. The sword in today's retail market would bring approximately $5, 000. ...is certainly a lot more valuable than any average Civil War images because it's an armed Confederate soldier, and particularly an armed Confederate officer. The image is a $3, 000 image.